I’m dying to know what kind of product you use to keep her hair in check. It is ADORABLE! Prettiest. Child. Ever. She looks so drastically different with curls and straight hair! She’s adorable anyway you look at her, but I must admit I am partial to the curls! These are great pics! She is such a beauty – curly or straight! oh my gosh, casey! i love it! i’ve always wanted to take my chi to jake’s hair, but i don’t think his mother will let me. biddys last blog post..workin hard…ha! My goodness, she is a gorgeous child. Oh my gosh, I’m seriously dying of cuteness. Right this minute! Please send paramedics! She is so freaking adorably cute that I almost can’t stand it. What gorgeous photos! She is really adorable. Elizabeths last blog post..Things That Make You Go "Hmmm…"
very cute. and so much like her mama! i do love those curls though! none of mine ever had curly hair…sigh. natalies last blog post..Contest #2…yeah…that number 2. My uterus just wept in jealousy. My God that’s a cute kid. Casey, that makes her look too old! Put it back! Wow! She looks totally completely different. The curls better fit her personality but wow that is hot! She looks so old with her hair straight! It’s adorable, but I still LOVE the curls! We have had AMAZING weather here in Louisville, too…so thanks, since we get all our weather from y’all, pretty much. Those are some adorable pictures. I agree with the commenter who mentioned she looks like Dakota Fanning. Kudos to you for taking the time to straighten her hair and to the Moosh for being patient enough to let you. She’s lovely Also, for some reason she looks so much MORE like you with the straight hair. She is completely gorgeous, and your photos are, as always, amazing. 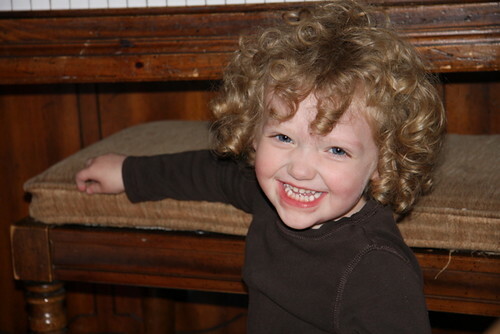 But I have to say, I ADORE the curls, and I wish like anything that my little one had hair like that. 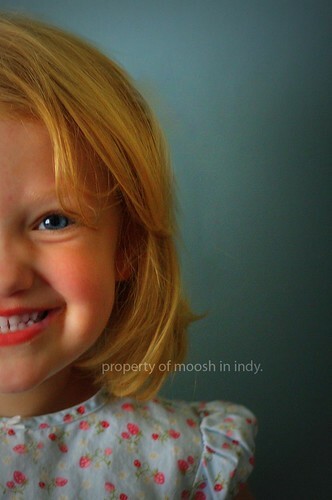 Ahhh… the Moosh is adorable, and her hair is delectable. MommyTimes last blog post..A Numers Game: Where in the world has MommyTime Been? Oh my gosh! Is it possible that the cutest girl ever could get any cuter??? Actually, it was something I wish I’d known before I got to college! She looks older with the straight hair – beautiful! pgoodnesss last blog post..i can haz mah bike back? Plz? WOW, with her hair straightened, she looks just like you in the #3 pic. She’s precious, but those curls are just yummy. The Moosh is delish! Do you attemp to eat her with a spoon on a daily basis? Oh wow, such a different look! She must be a very patient child – I’d love to see what Cordy looks like with her curls straightened, but I don’t think she’d ever sit still for it. Oh my gosh! She looks so grown up. Whoa! Good lord she’s the cutest thing ever! I have to ask, what do you do to keep her curls in order? Product, how often do you wash it? My girl has very similar curls and I can never seem to get them under control. Having stick straight hair myself I am completely lost when it comes to the curls. 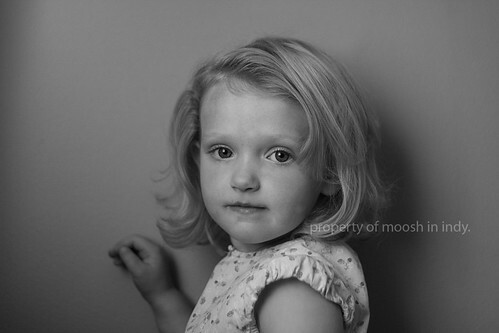 She is three now and starting pre-school and I would love for her not to look like a little ragamuffin within an hour of arriving at school. Help! Isn’t it neat that we can do that for our girls without resorting to nasty chemicals? Princess asked me to straighten her hair once and since I had time I said yes. After two passes of the straightening iron she said it was too hot and didn’t want me to do any more. Even though I only did those two sections it was such a difference. A totally different girl. And I didn’t realize just how long that hair is either! I’ll just be yet another voice to chime in telling you how cute the Moosh is!!! Your Moosh is adorable either way! I’m so glad I found your blog! 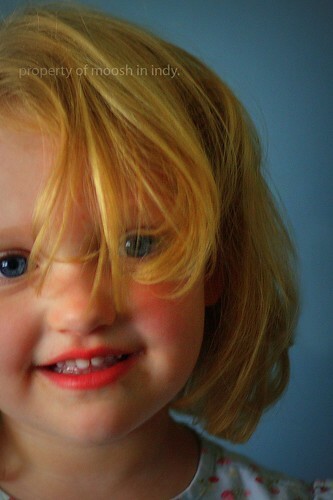 PS: My daughter has crazy hair, but I’m too scared to flat iron it! Megs last blog post..Is This How Einstein’s Mother Felt? I was thinking… “who is that little girl?”. With either hairstyle… she is just gorgeous. Oh those curls! You must leave them as is! She looks adorable with them (and without them, of course, but what I wouldn’t do for some curls)! Dude, it’s a totally different little girl. Just as cute…just different! OMG – what a hot little lady you have there. Stop it – she looks too much like a grown up. Does she drive a car yet? I miss you guys.